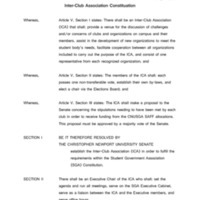 Senate proposal for the establishment of the Inter-Club Association. Proposal to change Section VI of the ICA By-Laws. List of events for members of the Inter-Club Association.